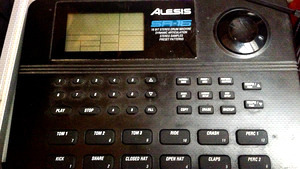 KitMonsters – Alesis SR-16. The music makers’ guide to making music. The hugely popular SR-16 has been used by everyone from songwriters to live performers to remix engineers and features 233 realistic, natural drum sounds, offered both in dry form and sampled with digital reverbs. Alesis’ Dynamic Articulation feature enables a drum sound to change its tonal content as it’s played harder which gives realistic performances. It has 50 presets played in by top studio drummers and quantized plus built-in rhythmic variations (with A, B and two Fill sections) for composing complete arrangements. You can create and save your own customized patterns and songs. It also features complete MIDI implementation, a footswitch input, flexible programming and editing features and velocity-sensitive pad buttons.